Competitor Course - CrossFit Tigard P.A.W. 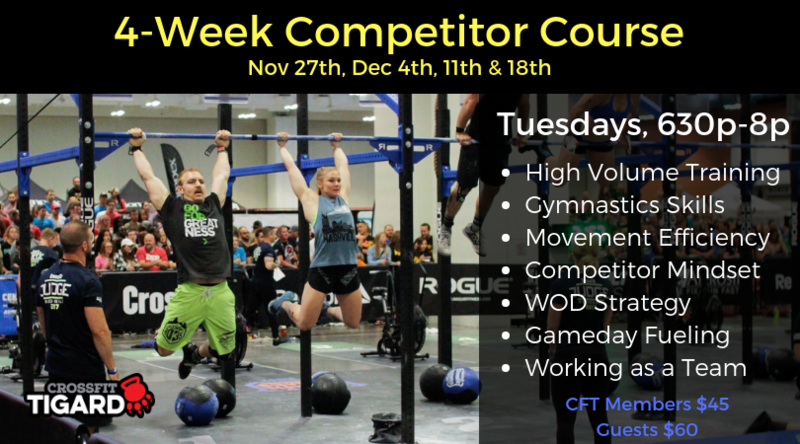 Join us for an incredible 4-week competitor course with Regional Athlete, and 2018 Wodtoberfest RX Winner, Derrick Dlouhy. Over 4 weeks, you will acclimatize to higher volume training, practice gymnastics skills, learn to cycle quicker and more energy efficient reps, as well as discuss the mental side of training such as WOD strategy, working as a team, mental strength, and competition day fueling. Registration Includes 4 x 90 minute Classes, Nov 27th, Dec 4th, Dec 11th, and Dec 18th.